My sister has been living in Madison, Wisconsin for six months now. If I happen to call her in the mornings, she’s usually driving to work and making exclamations about the scenery. “There are llamas out here! And so many cows. And miniature horses! There’s corn fields and barns, and corn fields and barns.” Everything is still novel to her, even the dew on the grass in the mornings as it shimmers and glints in the early sun. She loves it all and is tickled by all the open space, farm animals and changing of seasons (she hasn’t experienced a Midwest winter yet…). I was hoping to visit Julia in the warmer months, seeing that I’m not the biggest fan of cold weather, so I was kind of stressing out before I left. Was it was already going to be miserably cold and unbearable? What would we do if it was snowing? And all the touristy things we wanted to see were already closed for the season….so alas, we had to resort to doing a lot of my favorite activity: eating! As I’m sitting here in the airport writing, I still can’t shake the feeling of incredulity over one lunch I had with Julia’s husband Mark. Mark had been telling me that Madison has a large Hmong population, an ethnic group that comes from China, Vietnam, Laos and Thailand. My ears perked up and my taste buds took notice. Oh really? A South-East Asian community right here in lil’ ol’ Madison? Mark knows that I’m slightly obsessed with that region of the world and figured I’d be game to try one of his favorite restaurants. “Should we go…” He didn’t even have to finish the question. I was already in the front seat of the car, buckled up and waiting for him to get in and drive us to lunch. 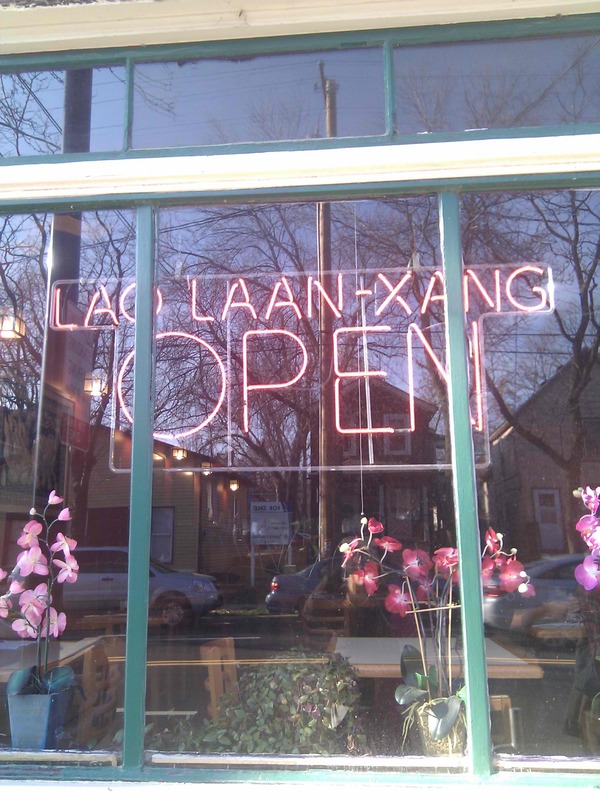 We arrived at a tiny restaurant called Lao Laan-Xang. It feels as if you’re walking through the door of someones home when you step through the front door. A warm hello is called out from the kitchen and a tiny little girl, maybe 4 years old, runs up with a couple of menus in her hand. She pauses at the table, half hiding behind the menus, to look at us with wide eyes. She giggles a silly giggle, hands us the menus, and hop skip dances away. I’m in love with the restaurant already. I opened the menu and was immediately impressed with the variety of dishes. The menu doesn’t tone down the authenticity, however you can choose your heat levels. The mother of the cutie-pie menu handler took our order and warned us that the foods can be very “strong” with the fermented fish flavors and fiery chilies. Mark and I both told her that we’ve traveled extensively through Laos (her homeland) and are there specifically for those pungent tastes. 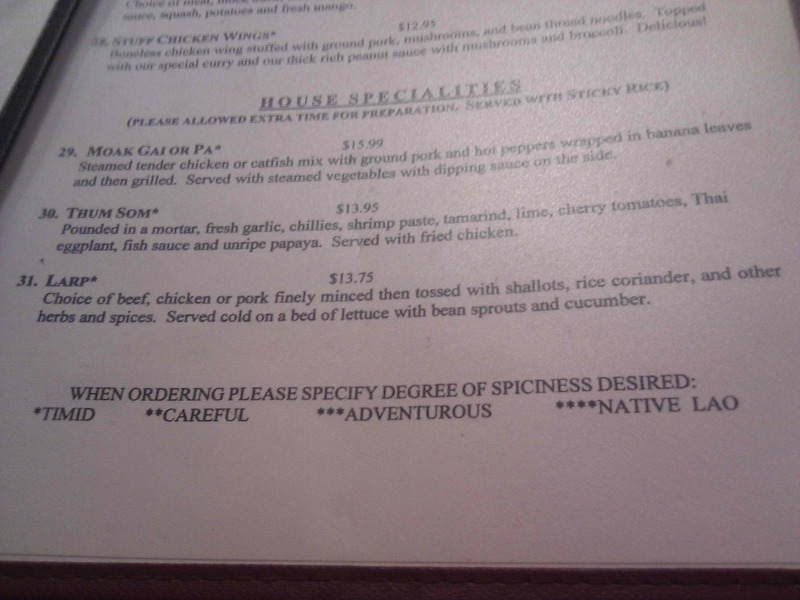 We ordered the “adventurous” heat level, though I really had been keen on ordering the “Native Lao” level. It’s a good thing we didn’t venture there because the spicy factor we chose was not far from incendiary. I think the Native Lao option is one of those things you can handle if you’ve either traveled through SE Asia for months and have worked up your heat tolerance…or you’re actually a native of Laos! Mark and I ordered up a storm. I chose my favorite salad in the world: green papaya salad. Mark ordered something called Moak Gai, which was a mixture of chicken and pork that was heavy on the herbs and grilled in a banana leaf. A soothing sweet curry of coconut and winter squashes cooled the heat from the salad. 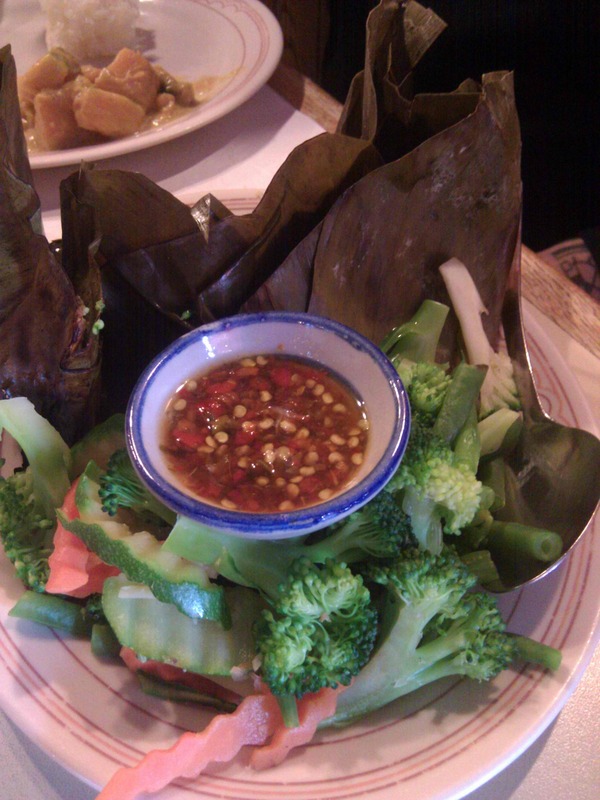 We mushed sticky rice between our fingers and dipped it in the chili and fish sauces. For a moment it felt like we were actually in Laos…in the middle of the Midwest! I have a hard time finding great Thai in New York, so finding incredible Laotian wasn’t even on my radar when I was coming out here. I thought we’d be drinking beer and eating fried cheese curds. Did I mention that I’m still flabbergasted?